You gotta get ice cream after swimming. Right? We actually used that as a bribe to get the kids out of the water…otherwise there would have been tears all the way back up to the room. Looking for ice cream stops on family vacation is no different than looking for places to eat. Sure. We could have just went to Culver’s…but where’s the fun in that? I started looking for ice cream shops around our hotel and found one just a couple of miles away. There were a few to choose from but I chose the one that does something interesting with their ice cream. 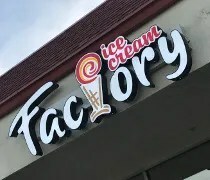 Ice Cream Factory is in a small strip mall in front of a Lowes on South 27th Street in the Milwaukee suburb of Franklin. The small storefront looks to be fairly new taking over the space from a gift shop sometime in the last year. The inside the store is fairly small. 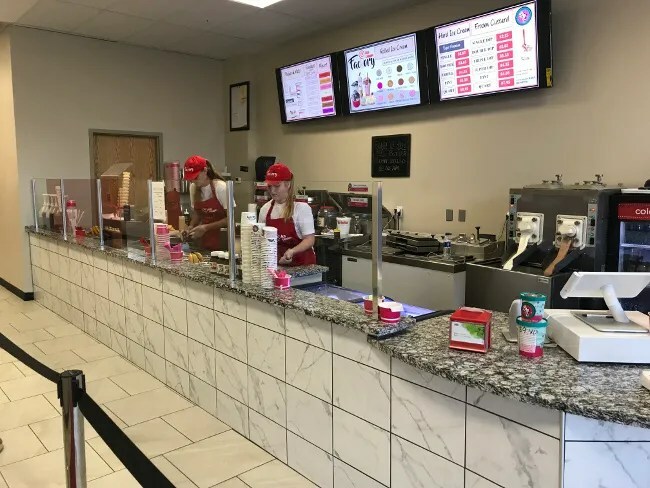 There’s a large counter where the work is done to make the ice cream treats and just two tables and chairs. There are two more tables outside so there’s not a lot of room to sit and eat on busy days. Lucky for us, this was not a busy day. They do the typical custard but they also do something fairly new. Rolled ice cream. Rolled ice cream? Yeah….actually, it’s a Thai thing that they call Stir-Fried Ice Cream. The ice cream isn’t really fried. It’s “stir-fried” on an steel plate that’s kept below freezing. The liquid base is poured on top of the mix-in ingredients then the ice cream is mixed around, like you would stir fry, until it’s chilled solid. 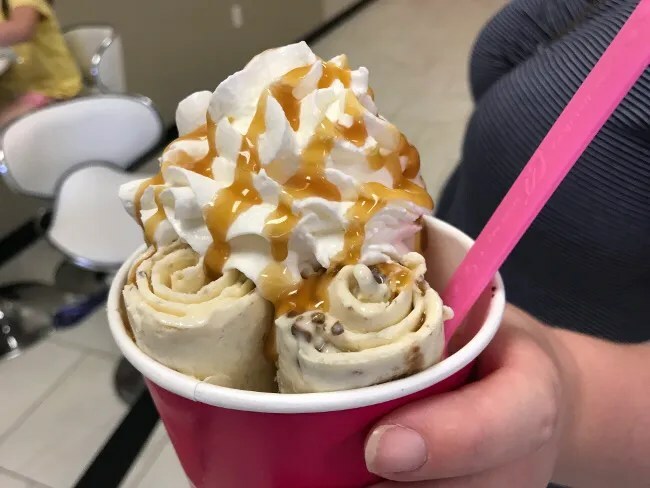 While the ice cream is still pliable, the employee spreads it out into a thin layer and then uses a metal spatula to roll the ice cream in to long tubes. 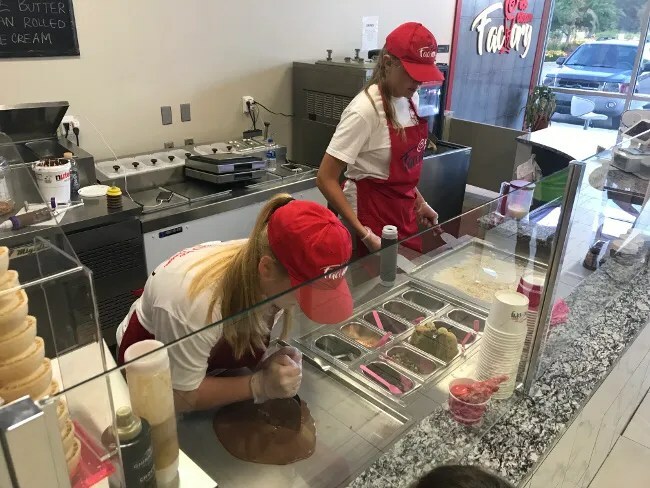 The idea is similar to Cold Stone Creamery except the ice cream starts as a liquid and solidifies on the steel plate while it’s being worked. The kids are not very adventurous. Each of them got one scoop of custard. Each picked a different topping. B picked something simple. He wanted vanilla custard with sprinkles. L did something a little different. 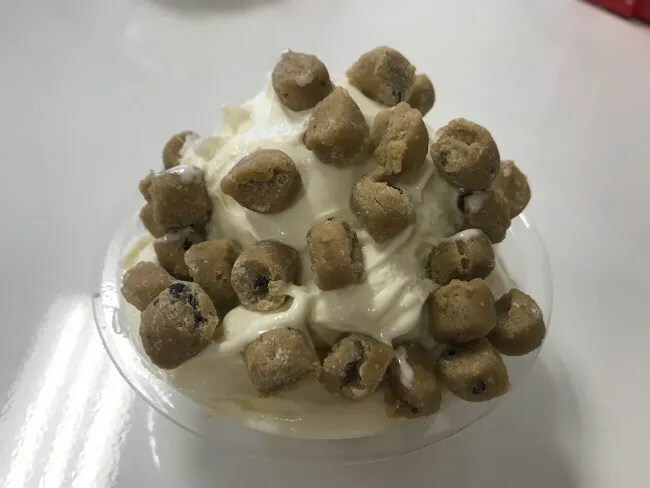 She got the same vanilla custard but asked for Cookie-Dough pieces to top. It wasn’t one of the options on the board but they had them for one of their rolled ice cream creations so they used them as a topping. The custard was creamy and delicious. The one scoop was too much for both kids. I ended up eating what was left of L’s but I couldn’t force myself to eat what B had left too. Both kids ate pretty much was what covered in toppings then they stopped. J and I were intrigued by the rolled ice cream. I ordered the Cookies and Cream. It’s as simple as it sounds. Vanilla ice cream with smashed up Oreos. It was really cool to watch them make this. They put the cookies down, poured on the liquid then took two metal spatulas and just pulverated the candy. 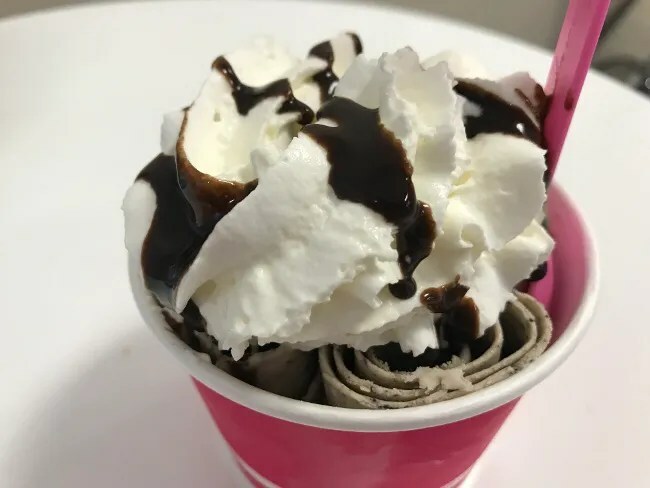 When the liquid solidified, they spread it out thin and poured some chocolate sauce on it then rolled it up in to five little rolls, topped with whipped cream and more chocolate and served it in a dish. The ice cream was delicious. I don’t know if they rolling it made any kind of taste difference but it did a texture difference. 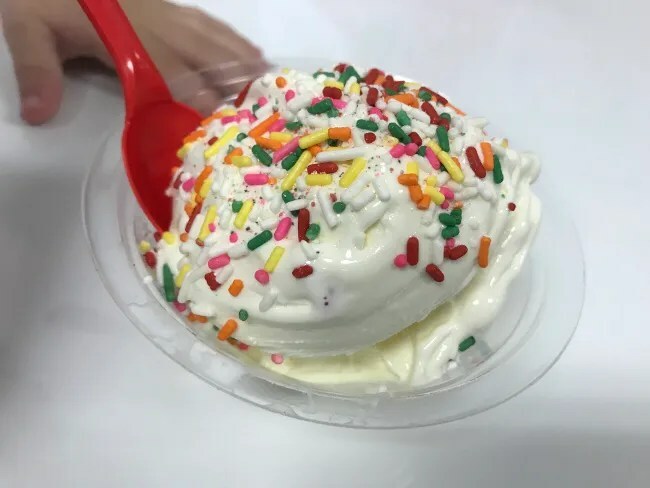 It was kind of between soft serve and hard pack ice cream….still soft enough that a plastic spoon easily slid through it but also had some bite left in it. J did a Carmelo rolled ice cream. It was the same basic idea as mine but they used a couple of pieces of a Carmelo bar and caramel sauce instead of chocolate sauce to top it. The price for the four ice cream treats was right around $20. 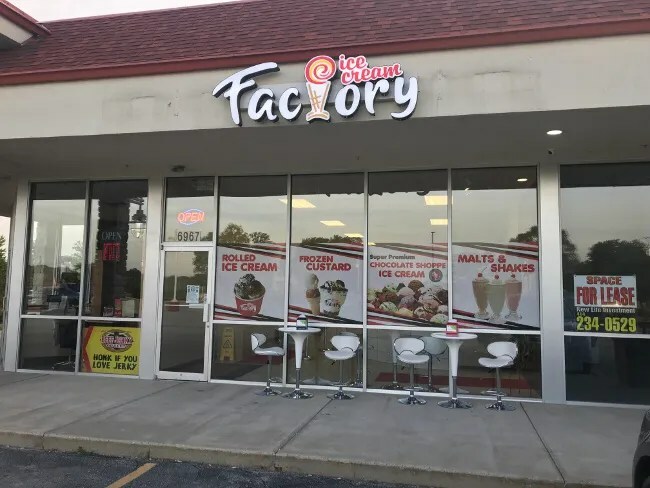 The Ice Cream Factory was a pretty cool find in the southern suburbs of Milwaukee. We could have done it simple and went to one of the chains, but I always like finding something new and unique. Neither of us had seen rolled ice cream before this trip so we definitely found something unique.